Today we did 5 gutter cleaning jobs in Bridgewater. Business has really grown for us the last year in Bridgewater. We have gotten a lot of word of mouth business for both gutter cleaning and power washing. We must have done about 10 house on Vanderveer Rd and the surrounding streets. Halloween is past and that means the busy holiday lighting season has begun for Reliant Home Services. 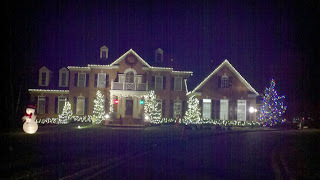 This is a picture from last year of a home we decorated in Short Hills, NJ. We will be returning tomorrow to install their Christmas lighting display again this year. We packaged everything and stored it away so we can return and install everything again. This year we will be adding more to this display as there are a few more trees the customer wants to have decorated. Yesterday was a beautiful warm Saturday afternoon that seemed more like summer than fall. But make no mistake, fall has arrived and the leaves are really coming down now. The day after Halloween saw rain and high winds so the leaves are really down off most trees and the phone calls are coming in for gutter cleaning. Customers are realizing that gutter cleaning in NJ is in full swing now. We were very busy cleaning gutters in Montlcair NJ and the surrounding towns of Glen Ridge NJ and Verona NJ. The neighborhoods we filled with homeowners cleaning leaves on their properties. To accomodate the demand of our customers Reliant Power Washing and Gutter Cleaning located throughout Northern and Central New Jersey, is open 7 days a week. Our courteous and professional staff will clean all gutters out by hand and then flush the gutters and downspouts with our hoses to make sure everything is draining properly. At Reliant , we strive for customer satisfaction and have built our company one satisfied customer at a time. To make an appointment give us a call at 855-467-3542 (855-Go-Reliant, or click here to visit our website at www.Go-Reliant.com We look forward to making you are next satisfied customer.